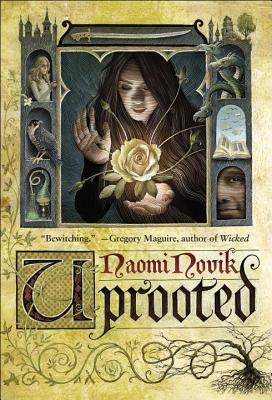 It Took a Month, Was It Worth It: Uprooted by Naomi Novik | Howdy YAL! This book has gotten a ridiculous amount of hype. It took me a month to read it. Does that mean, I didn’t like it? No. Because last month was really messed up. It probably didn’t help the book though that it’s style was fairly akin to a Kathleen Woodiwiss novel. Meaning, it took a long time to read this even when I had the time-I traveled in early July and still didn’t finish this on the plane. This is coming from someone who can usually finish a book in a good half a day or less with no interruptions. And honestly, a Woodiwiss book would take me less time to read. The prose really isn’t something I normally would read, but I did get used to it after awhile. Although, I really think it hindered rather than helped the story. What I did love about the book was the way the relationships between the characters developed in the book. And that did not include romantic relationships, but friendships as well. Honestly, the romance in this book was really a supporting element rather than the main relationship which was the friendship between Agnieszka and Kasia. That friendship was what drove the book, and it was refreshing to see a book that didn’t try to trivialize said relationship once the main character got involved in a romantic relationship. To be honest, I shouldn’t have liked the romance as much as I did. I think it’s because I have a thing for Beauty and the Beast romances. I know that they are ridiculously unhealthy, but I just get wrapped up in the whole romance of it-I blame seeing Beauty and the Beast five million times in my childhood. That AND it’s always good to read about. Not good to live in real life since no one wants to be forced to like with a grumpy guy who may or may not be cursed. Though, this wasn’t a Beauty and the Beast retelling-directly. It more or less, mixed elements of Polish folklore into the story with heavy winks to Beauty and the Beast in the romance department. I think what worked about this romance to me, is that Novik tried to give the relationship balance when it came to power. That is something that you rarely see in these romances, and even though it wasn’t completely perfect. It worked really well for the most part. The actual plot of the novel for me, was a bit of a let down. While The Wood added a new element to the fantasy, there wasn’t really anything that different that I haven’t seen outside of YA fantasy.It still had the same old, same tropes. That didn’t mean I didn’t enjoy the book though. As I said before, the banter between the characters kept me engage. Oddly, it was during the periods of introspection and act in the book that I didn’t like. The main character just was really dumb a lot of time…and I honestly felt those parts dragged a bit. Never good when your action scenes drag. I do recommend Uprooted with reservations. I don’t quite by the hype, except I’ll admit when the two leads interacted together they were hot. Overall Rating: A reluctant B.